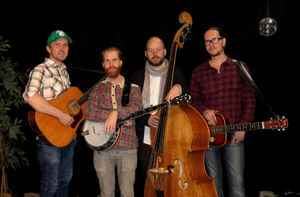 The Original Five is a bluegrass band from Malmö, Sweden. The band was born in the summer of 2010 out of a common desire to play bluegrass music. We held a popular weekly gig at restaurant Far I Hatten in Malmö for two years. Since then we’ve played over 250 gigs at clubs, weddings, parties and festivals in Sweden, Europe and USA. Musical foundation is the classic bluegrass from the 40’s an 50’s but there’s also modern influences, not least in the bands own song writing, which constitutes a large part of the repertoire. In live situations you can expect a healthy dose of classic bluegrass songs and the odd country number in addition to the bands own material. There’s been as many as seven of us but currently we’re touring as a quartet.